Spring time is the best time to drag out those pastel shades whether in the form of apparel or nail paints. As such, for my collaboration with Vesper 247 I chose this fitted number, the Ember one shoulder midi dress. 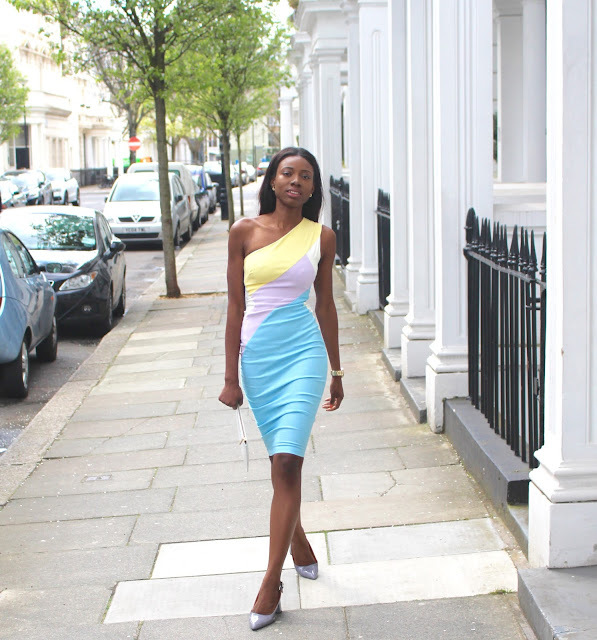 I was first drawn to the pastel shades and more over the one shoulder design which is ideal for the spring/summer season. It is the perfect number to bridge the gap between spring and summer. I can honestly say that the Ember one shoulder dress hugs my body perfectly like Vesper says. I often have to alter my dresses so they can be more fitted at the waist. However on this occasion I didn't have to as the dress clung on to every single bit of me as though it was custom made. I was actually quite impressed by the use of sculpture technology fabric ember for this dress, it really does the job. I will be looking forward to wearing this number for those spring/summer lunches and it will also make for an ideal dress when the wedding season comes round. What are your thoughts on this one shoulder number?